At Barrett Family dental, we know that a lot of our patients have questions about the safety of their old amalgam fillings. As a Beaverton family dental care provider, our team strives to answer any questions you may have about the right type of dental filling for you. The biggest question surrounding amalgam, or metal, fillings relates to the trace levels of mercury these types of fillings contain. While the potential adverse health effects of mercury have long been the subject of debate among members of the oral health community, the extent to which dental fillings impact mercury levels in the body remains unknown. However, a new study has discovered that individuals with multiple metal dental fillings showed significantly higher levels of mercury in their blood when compared to those who did not have any fillings. This latest study, which examined data collected from nearly 15,000 study participants, marks the first to actually find a link between dental fillings and mercury exposure in a nationally representative population. Researchers discovered that individuals with nine or more fillings had roughly 150 percent more mercury in their blood when compared to patients without any amalgam fillings. Researchers conducted additional analysis of mercury exposure by specific types of the element and found a dramatic increase in methylmercury, the most toxic form, linked to dental fillings, suggesting that the human gut microbiota, an assortment of microorganisms living in the intestine, may actually transform different types of mercury. Fears over mercury exposure due to dental fillings is not a new concern. However, previous studies were highly inconsistent and limited, according to researchers from the University of Georgia’s College of Public Health who spearheaded this latest review. The focus of this particular study is to determine the most accurate levels of exposure, which researchers will use to create a scientific basis in which to make more accurate future risk assessments relating to mercury exposure. In response to the study’s findings, the American Dental Association issued a statement that sought to clarify that the association’s stance of amalgam fillings remains unchanged. Currently, both the U.S. Food and Drug Administration and the ADA consider amalgam fillings safe for adults. However, both organizations do recommend against the use of amalgam fillings in children 6 and younger and in pregnant women. If you’re in need of a dental filling to correct the effects of tooth decay, your Beaverton family dental care provider will be happy to discuss the pros and cons of both amalgam and composite fillings before continuing with your treatment. 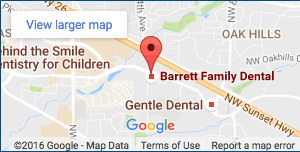 Your health, safety and wellbeing rank as our number one priority at Barrett Family Dental, and we are happy to answer any questions you may have regarding your treatment options in advance of care.